Like rainy days and Christmas songs, rye bread is one of those things that you either like or you don’t. I definitely fall into the first camp, although in a couple weeks I might start complaining about those first two. I like rye; heck, I can’t think many breakfasts more enjoyable than a dark, toasty pumpernickel bagel spread with cream cheese and lox (and that’s saying a lot, because breakfast is my favorite meal!). But I haven’t gotten to know rye as well as I know say, whole wheat flour or cornmeal. Beyond traditional caraway-flecked rye bread, I haven’t done much experimenting with whole rye berries, rolled rye (like oatmeal), or rye flour. And from what I’ve read, it sounds like I should. 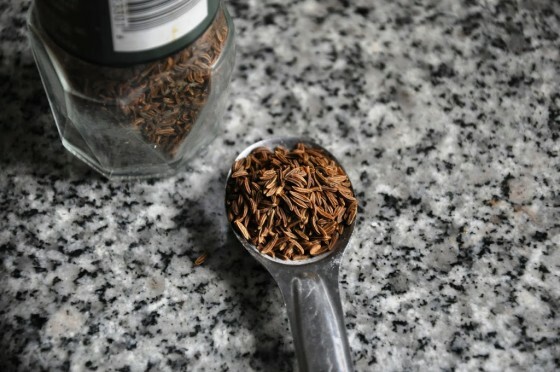 A good source of fiber and minerals, rye has been shown to promote weight loss and satiety, in addition to preventing and fighting diseases like cancer, diabetes and heart disease. Healthy benefits aside, there’s something intriguing about the flavor of rye; subtly sweet and toasty, earthy even. After making an awesome rye version of Jim Lahey’s no-knead bread for Thanksgiving, I was inspired to continue experimenting with rye at my favorite meal.Rye waffles. Sound weird? 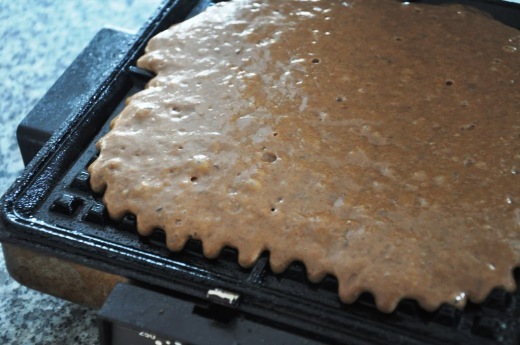 Hear me out: the dark, slightly sweet and complex flavor of a good pumpernickel bread but in waffle format. You could go savory with a topping of chive scrambled eggs and crème fraîche or sweet with kirsch flambéed cherries and whipped cream. Rye doesn’t sound so boring now, does it? I combined hearty rye flour with whole wheat and all purpose flour, peppery caraway seeds, molasses and a touch of cocoa powder for color. Yeast and a quick ferment (two hours, but you could make the batter the night before and refrigerate it) lent a hint of sophisticated sourdough flavor and leavening. 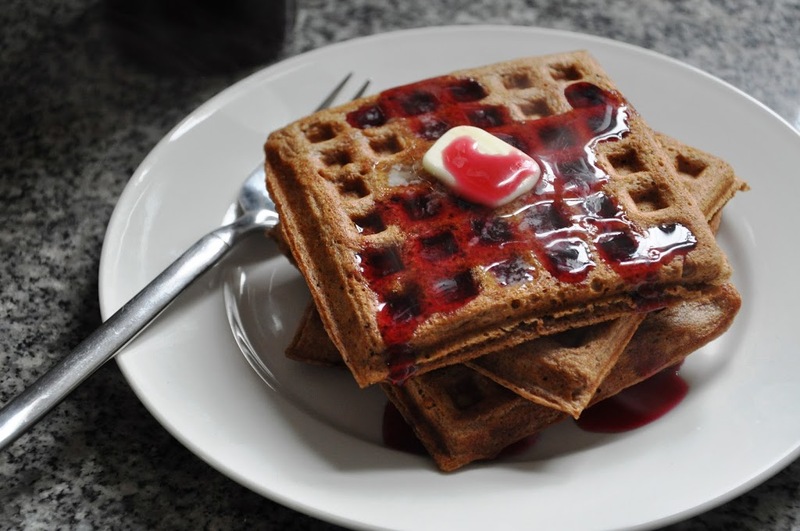 A pat of butter and a drizzle of homemade Montana chokecherry syrup transformed the crisp brown waffles into a breakfast worth waking up for. Chokecherries are indigenous to North America. High in antioxidants, they are also very astringent and can’t be eaten raw but are delicious cooked into preserves or syrup. We are lucky enough to have family friends in Montana send us out a bottle each year for Christmas! Make the batter. 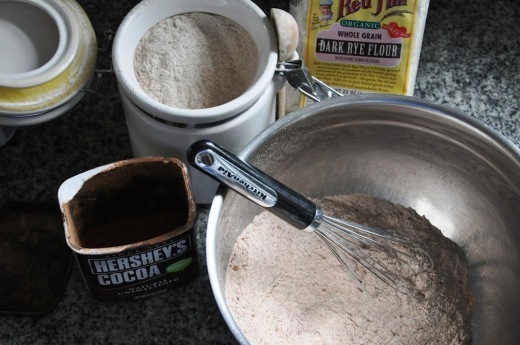 In a large bowl, whisk together the flours, cocoa powder, salt, yeast and caraway seeds. 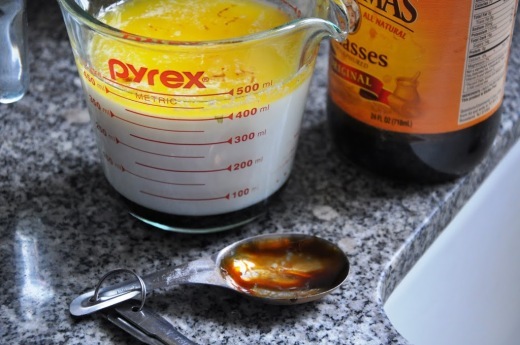 In a separate bowl, whisk together the milk, butter, molasses, vanilla and eggs until thoroughly combined. Whisk the wet ingredients into the dry ingredients until just combined (a few lumps are okay). Let the batter ferment. Allow the batter to sit, covered with plastic wrap, at room temperature for at least 1 hour and up to 3 hours. 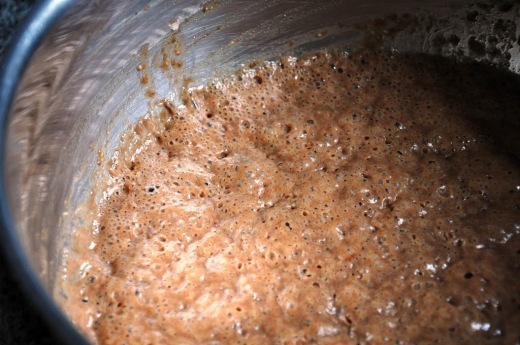 The batter can also be made the night before using and refrigerated overnight. Cook the waffles. Preheat your waffle iron. Bake waffles according to the manufacturer’s directions, until golden brown on the outside. Keep warm in a 200°F oven until ready to serve. Serve hot with butter and chokecherry syrup. Chokecherry syrup is the perfect topping: a Montana luxury! and the waffles sound great too.